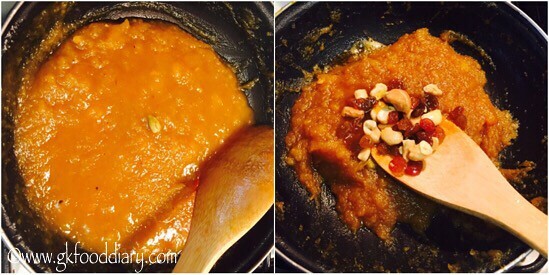 Yellow pumpkin Halwa/ Kaddu Ka halwa – an easy and healthy dessert made with mashed yellow pumpkin, ghee, and nuts for babies, toddlers, kids and for the whole family. Pumpkin is a healthy and tasty food for babies and growing kids, as its rich in nutrients. 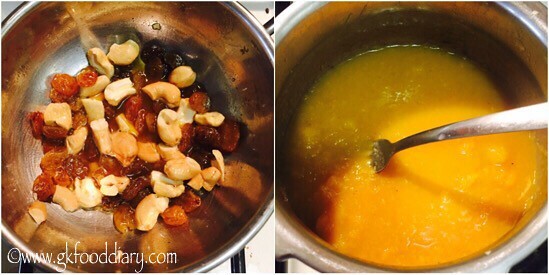 I have already posted pumpkin kheer and wanted to try halwa with pumpkin from a long time. 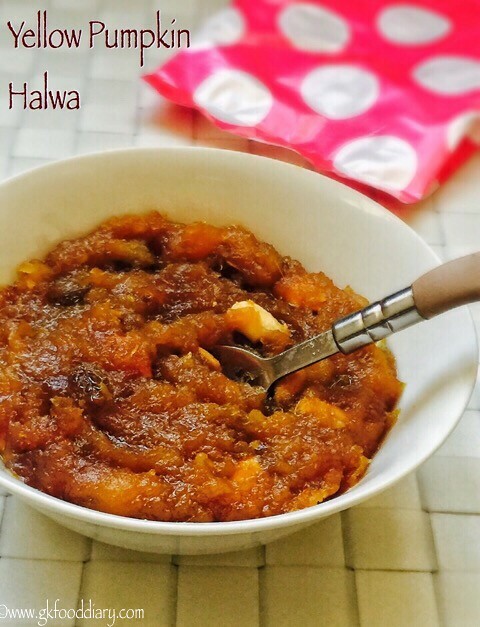 It turned out so good, melts in the mouth and a big bowl of halwa got over within 10 minutes:) The taste, texture, and preparation of this halwa are similar to sweet potato halwa! 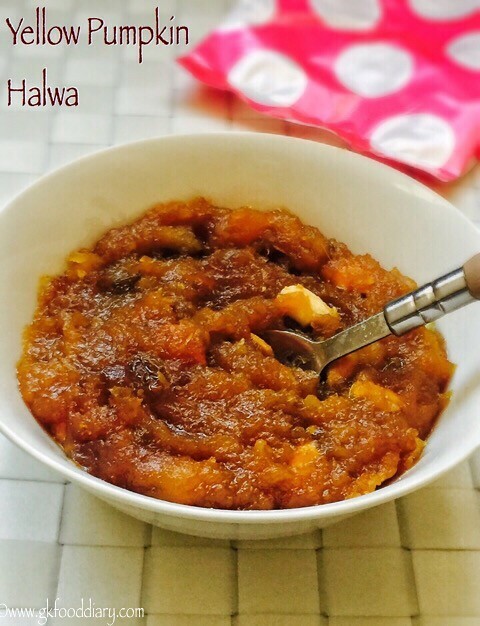 This pumpkin halwa can be given to babies after eight months as a dessert (See notes section for the points to consider while preparing this for babies below one year). 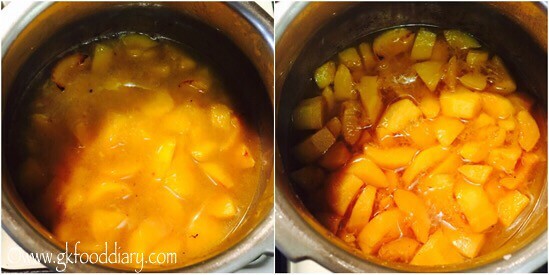 Now Let’s check how to make this yellow pumpkin halwa recipe for babies, toddlers, and kids. 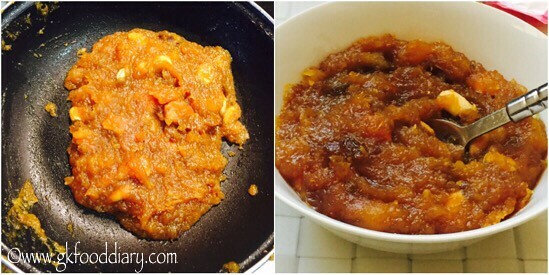 Yellow pumpkin halwa - halwa recipe with yellow pumpkin, ghee, and brown sugar/jaggery. Keep all the ingredients ready. Wash, peel and chop the pumpkin into cubes. Discard the seeds. Then add a tbsp of ghee in a pressure cooker and add the cut pumpkin pieces and saute them nicely in low flame until water oozes out from pumpkin pieces. It may take 5-7 minutes. Then pressure cook pumpkin ¾ cup of water for 2-3 whistles. Open the cooker once pressure released. In the meantime, Heat a pan with a tbsp of ghee and add cashews and raisins, fry them until golden brown. Remove from the pan once done. Mash the cooked pumpkin pieces well with a fork. Now add mashed pumpkin to a pan and fry them for two minutes in low, medium flame. Then add required amount of jaggery/brown sugar & powdered cardamom to it and mix well. After adding sugar, the mixture will be liquefied and gets thicken up with time. Give a quick and switch off the flame. Remove from the pan once its warm and serve in bowls. 1. Keep all the ingredients ready. 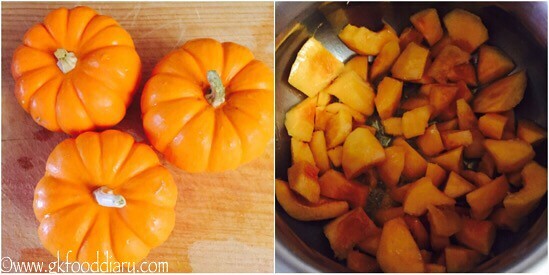 Wash, peel and chop the pumpkin into cubes. Discard the seeds. Then add a tbsp of ghee in a pressure cooker and add the chopped pumpkin pieces and saute them nicely in low flame until water oozes out from pumpkin pieces. It may take 5-7 minutes. 2. Then pressure cook pumpkin 3/4 cup of water for 2-3 whistles. Open the cooker once pressure released. 3. In the meantime, Heat a pan with a tbsp of ghee and add cashews and raisins, fry them until golden brown. Remove from the pan once done. Mash the cooked pumpkin pieces well with a fork. 4. Now add mashed pumpkin to a pan and fry them for two minutes in low, medium flame. Then add required amount of jaggery/brown sugar & powdered cardamom to it and mix well. After adding sugar, the mixture will be liquefied and gets thicken up with time. 6. Give a quick and switch off the flame. Remove from the pan once its warm and serve in bowls. 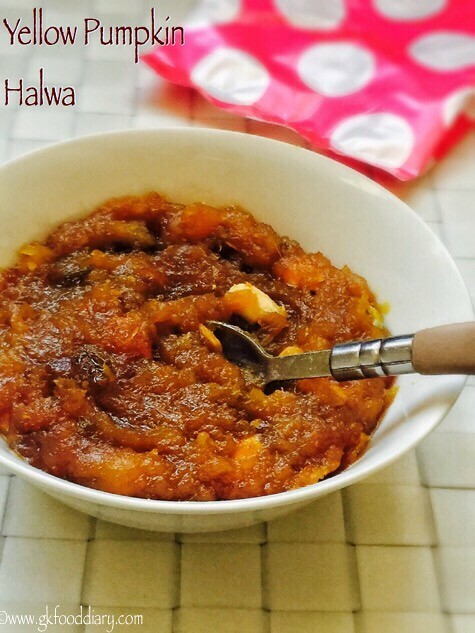 Delicious pumpkin halwa is ready! 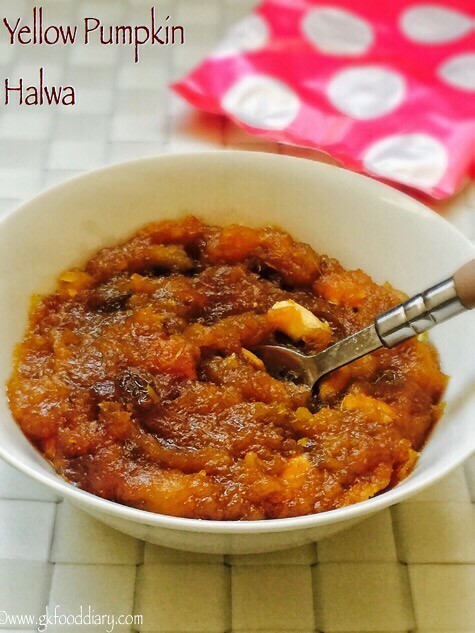 When you prepare this halwa for small babies, make with less ghee (2 tbsp max) and give a small amount. Don’t prefer whole nuts for small babies, instead add powdered nuts. Also, use dates syrup and pureed raisins as a sweetener instead of brown sugar/jaggery. Serve in semi thick consistency. Use white sugar to get get yellow colored halwa. But using brown sugar/powdered jaggery is a healthy option! I used a mini yellow pumpkin variety, you can use a big pumpkin variety too. 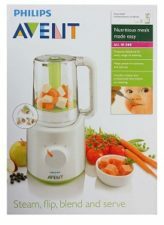 For babies above one year and adults, you can use milk instead of water for extra taste and richness. 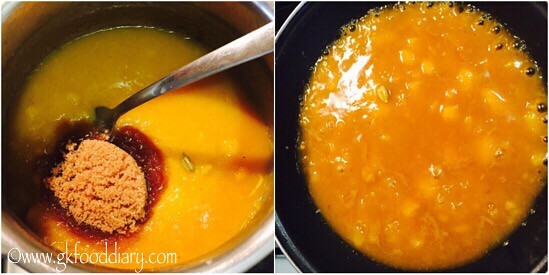 Adjust jaggery/ sugar according to the sweetness of pumpkin. I added milk and it curdled. Can u elobrate on when and how to add milk? If you are using milk , add it while cooking the pumpkin…grate pumpkin and cook with milk in a open pan/cooker..once the pumpkin is cooked and all the milk is absorbed, add sweetener.hope it helps!